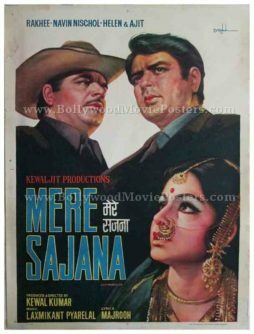 Old hand painted Bollywood movie poster of the Hindi film Mere Sajna (1975) for sale. Featured here for sale is a vintage hand painted Bollywood movie poster of the 1975 Hindi film that starred Raakhee and Navin Nischol in lead roles. Printed and circulated during the original first release of the film (early 1970s), this hand painted Bollywood movie poster was originally designed for publicity of the film but never ended up being used. This vintage Bollywood poster has been hand painted by one of the greatest Bollywood poster artists of all time, DR Bhosle. A printed signature of the noted Bollywood poster painter DR Bhosle is seen on the top right hand corner of this hand painted Bollywood movie poster. Typical of his distinctly minimalist approach to Bollywood poster design, this hand painted Bollywood poster features tell-tale signs of DR Bhosle’s artwork. The background is plain white and the focus is completely on the three leading figures from the film. Captured in stunningly accurate hand painted portraits, Ajit is seen wearing a cowboy hat on the top left. Navin Nischol appears alongside while actress Raakhee is depicted in a stunning avatar at the bottom. This poster has been graded as ★★★ Average mainly due to water stains on the poster – clearly visible in the poster image shown alongside.